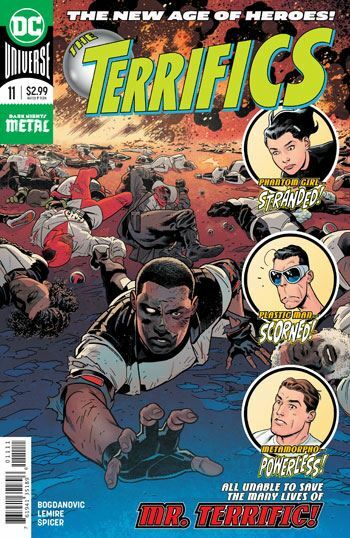 The Terrifics remain broken up in this issue, but each of them gets some significant development in this issue. Interestingly, in each case this deals, in one fashion or another, with family. I’m not going to give everything away, but we do get to meet Plastic Man’s son and Phantom Girl’s mother. With neither is the relationship easy or happy. Metamorpho, who I guess I ought to just refer to now as Rex Mason, got his wish, his powers are gone, but he is not finding life with Sapphire nearly as fulfilling as he had hoped. As for Mr Terrific, well, there is a great development here, but I’m going to keep my mouth shut. There is also a great tease for the next issue, but I won’t talk about that, either. The fact that each of the four plot threads, while distinct, play on the same theme is a definite plus. And, in a way, the tease for the next issue plays on it as well. Because, like it or not, the four members of the Terrifics have become a family in and of themselves. Trying to move from the bond they had formed to deal with people who they feel they ought to have the bond with, but don’t, is making the break up of the team worse for them. Almost one year in, and this series have achieved everything I hoped for it, and gone far past.